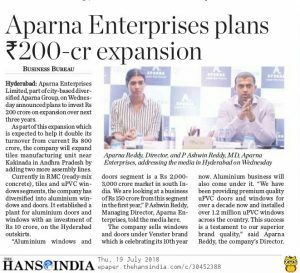 Aparna Enterprises plans Rs 200 Cr Expansion. 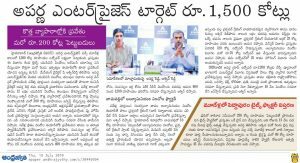 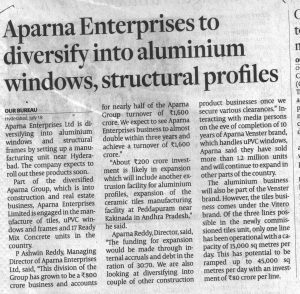 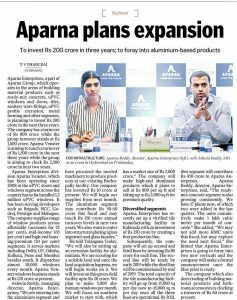 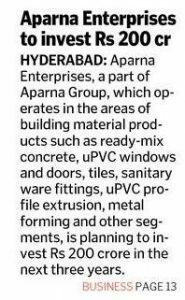 Aparna Enterprises Ltd (AEL), the building materials manufacturing arm of the Rs 1600 crore Aparna Group, on Wednesday(18-July-2018) said it will be investing Rs 200 crore over a period of three years in diversifying into new segments and expanding its existing facilities as part of the group’s plans to hit the Rs 2300 crore turnover mark by 2020. 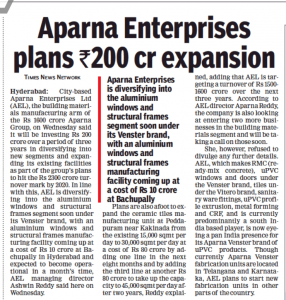 In line with this, AEL is diversifying into the aluminium windows and structural frames segment soon under its Venster brand, with an aluminium windows and structural frames manufacturing facility coming up at a cost of Rs 10 crore at Bachupally in Hyderabad and expected to become operational in a month’s time, AEL managing director Ashwin Reddy said here on Wednesday(18-July-2018).